That's pretty Hallow-weak if you ask me. Halloween Humor - Who doesn't enjoy some good monster jokes? Or, for that matter, some really bad ones? While most of us remember Jim Varney from his work on the popular television series Pink Lady and Jeff, it turns out he made a couple of these Ernest movies too. Who knew? This one is the aptly named Ernest Scared Stupid and in celebration of Halloween week here at Sly Records, we present it here for your pleasure. As you can see, Daily Variety called it "wacky." 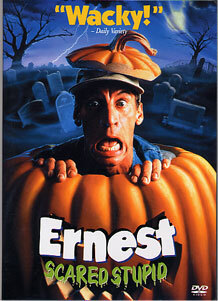 Oh, this must be the one where Ernest acts like a retarded jackass. I heard about this one! 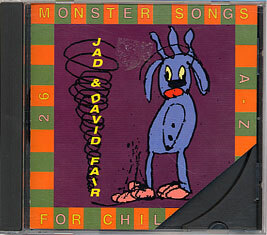 A great Halloween album for the kiddies, this one features a bunch of spooky ballads about Godzilla, Jabberwockies, and the Invisible Man. And it's on Kill Rock Stars, so you have to act like you're into it, even if you're not. Hallow-weak - A good way to describe something weak that takes place on Halloween. Origin - Dude, I could tell you, but it's so scary you would surely piss your pants. Usage - "Dude, this trick or treating is going pretty well, but I sure wish those skanky older ladies in the witch costumes would have invited us in forsome of that Coors Light punch they were drinking." "Dude, I know. Those cougs could have at least offered us some brew. That was Hallow-weak."